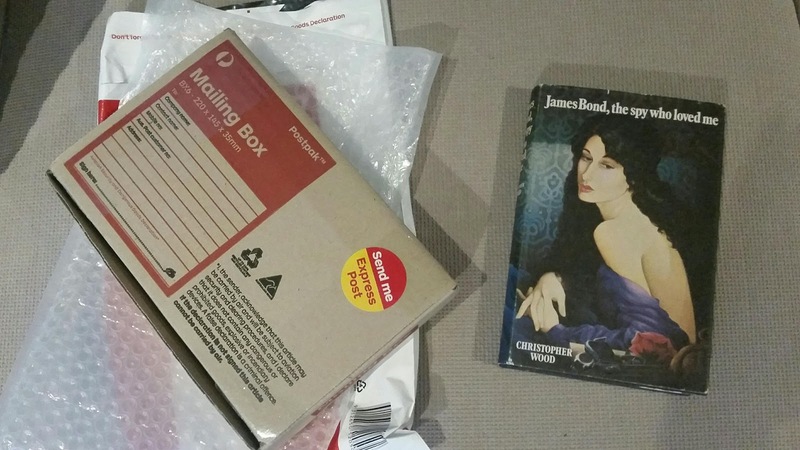 A couple of weeks ago I noticed a copy of Christopher Wood's "James Bond, The Spy Who Loved Me" for sale on the web. I've been searching for this elusive hardback for years. So when I found a copy available and read that the book was a 1977 First Edition - Jonathan Cape, NOT ex-library, and the price was just over AU$300 I immediately went about the process of purchasing it. Today the book arrived in the mail. It's not perfect but for such a rare book I'm very happy with it. Plus it's great to finally have it on the shelves between Fleming, Markham and Gardner. Terrific purchase. Congrats. Rather jealous, actually. Doubt you'll get as lucky with "James Bond and Moonraker", but hey, who knows.